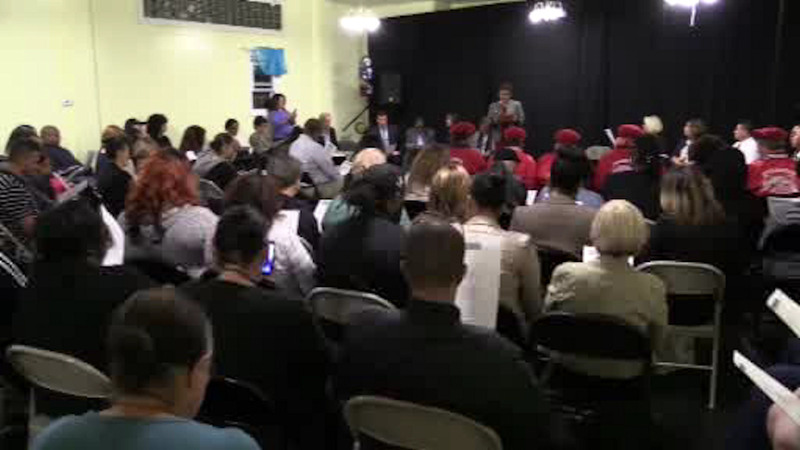 CENTRAL ISLIP, New York (WABC) -- A rattled Long Island community came together on Wednesday night to address concerns following the recent murders of four teenagers. Suffolk County Police Commissioner Tim Sini, Legislator Monica Martinez, and other local officials attended a meeting at Teatro Yerbabruja in Central Islip and answered questions from local residents worried about the recent gang violence in that community and Brentwood, where the teens remains were found. The discoveries of 16-year-old Kayla Cuevas, 15-year-old Nisa Mickens, 19-year-old Oscar Acosta, and 15-year-old Miguel Garcia Moran within the last few weeks have sent shock waves through the community and left officials looking for answers. Police believe that gangs were involved in the deaths of the four teens, but so far have no suspects. Anyone with information is asked to call Suffolk County Crime Stoppers at 1-800-220-TIPS or text "SCPD" and your message to CRIMES(274637).